TI Sparkle Turkey Telekomünikasyon Anonim Şirketi, formerly known as Mediterranean Nautilus Telekomunikasyon Hizmetleri Ticaret A.S., is part of Sparkle Group, a leading global telecommunication provider of IP, Data, Cloud, Data Center, Mobile and Voice solutions. Sparkle Turkey provides Network, Data Center and Cloud Services in Turkey with its privately owned Premium data center facilities in Istanbul, offering cost effective solutions that best fulfill the performance, efficiency, flexibility and quality standards required by customers. Sparkle's Mediterranean backbone is the first and only ring protected network in the region based on leading edge DWDM technology, providing seamless connectivity between Italy, Greece, Turkey, Israel and Cyprus by way of a 10,800 km Submarine System fully interconnected with Sparkle's Pan-European and Atlantic backbones which extend its reach into major cities of both Europe and North America. Sparkle is committed to innovation, flexibility and the highest service level in the industry. With a fully diversified Network and advanced facilities, Sparkle is the choice of preference of many global and regional carriers as well as MNCs and corporate customers in Turkey. Sparkle is also a leading Cloud and Data Center solutions provider through proprietary next generation assets in Istanbul. Sparkle Full Outsourcing solution provides a unique interface for the provisioning, installation and maintenance of networks and devices worldwide and offers a global network outsourcing service strongly based on caring & assurance. A single point of contact for customers’ network management solutions. Sparkle is a broadband network services provider with an undersea, state-of-the-art, fiber-optic network in the Mediterranean region. 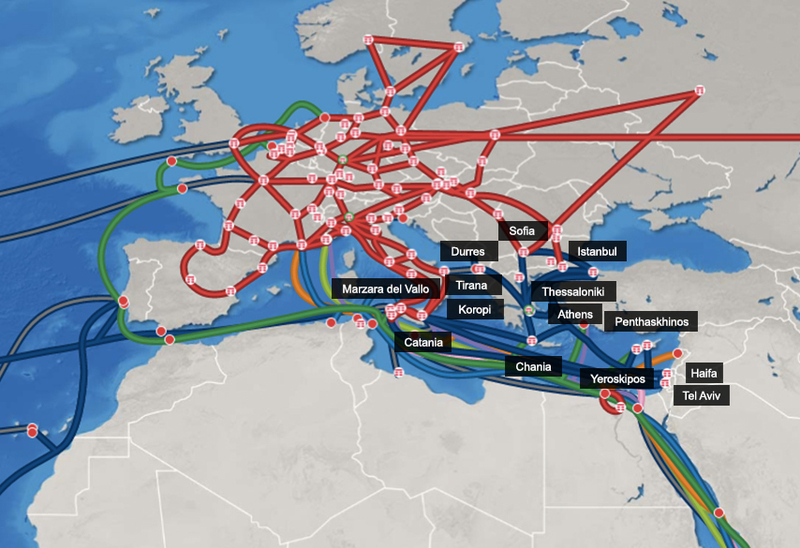 Using leading-edge DWDM technology, the Mediterranean Network provides seamless connectivity from the Mediterranean region to Western Europe and the US. The network spans approximately 10,800 Km of Sparkle’s interlocking loop system, linking Italy, Greece, Turkey, Israel, as well as the Pan-European and Atlantic wavelengths which link the major cities of Western Europe to North America.